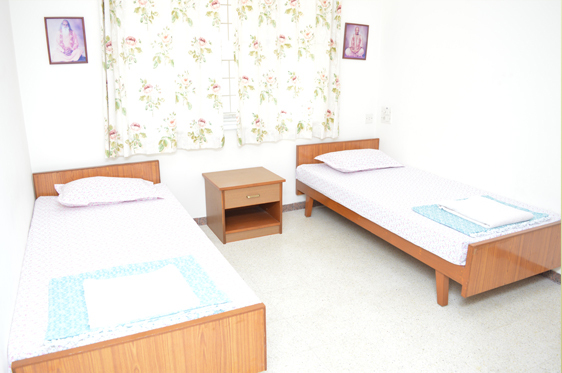 The Integral Yoga Institute (IYI) has five guest rooms, each with two beds and an attached bath. These are available for those who want to immerse themselves in the experience of Yoga. Two hatha yoga classes are offered each weekday for guests. The Integral Yoga Institute operates in accord with the teachings of Sri Swami Satchidananda. All at IYI follow His teachings and the Yogic way of life, which fosters the physical, mental, emotional and spiritual development of the individual and the creation of a living unity among individuals. As a center for the study of Integral Yoga, it is expected that guests have come for the purpose of learning about and living the Integral Yoga lifestyle. There are Hatha Yoga classes on weekdays, both in the morning and evening, which guests are welcomed to attend, provided that the class is not crowded and that the class instruction is at the level suitable for the guest. No meat, eggs, alcoholic beverages, cigarettes or intoxicants of any kind are to be brought into the premises, nor to use by the respective guests, even while away from the premises. Sexual activity is not allowed in the institute, outside of marriage and also discussions should be in language appropriate for an ashram environment. Meals are not provided as part of lodging. Excellent restaurants are nearby. Silence is observed from 10 PM to 6 AM. You are expected to be on the premises latest by 9 PM. Keeping in mind the limited space, smooth functioning and to preserve the calm atmosphere of the institute, visitors are not generally encouraged. However, visitors can be allowed on obtaining prior permission from the front office, on providing the necessary details. Reservations are on a space-available basis and should be made minimum 48 hours in advance.